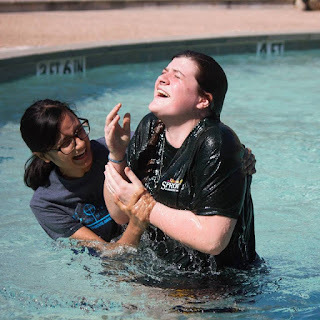 Hannah's Ministry Updates: How Is It Already March?! Some cute girls and me hanging on campus! Hi!! I’m so happy to be writing this. I had many moments this month where I thought to myself, “I can’t wait to put this on my blog!” February seemed to zoom by, and here we are in March with a new post! This month, God has revealed so much to me about Himself. As I reflect on what He’s shown me, I grow more and more convinced that His timing is absolutely perfect, He is very near, and He is very good. I’m praying this blog post will help articulate why I’ve come to that conclusion, thereby blessing you in your understanding of Him! Us Apprentices recently finished up our Intro to Pneumatology class (I’m convinced it’s called that because Garrett, the guy who teaches the class, likes big words… In simpler terms, it’s our class on the Holy Spirit). I am so thankful to have had the opportunity to take that class! We read through the book Paul, The Spirit, and the People of God by Gordon Fee. That book totally rocked my world but my favorite part of class was getting to discuss with Garrett and the other Apprentices about what we were learning. One day Garrett was talking about how many of us have an objective understanding of God, we know Jesus forgives us, but how many of us can say, “yeah, and I know the guy! Here’s what He said to me last week, here’s how He’s changed my life, etc.” This is how the Holy Spirit works! He isn’t some watered-down version of Jesus. The Holy Spirit is God! And He is a “He”, not an “it”. Learning about Him in this class has allowed me to experience Him more and more. He really does answer prayer, He’s so close, and He’s so, so loving. Twice a year we put on this event for all our campuses called Pizza Theology. It’s 4 hours of lecture on a particular topic lead by multiple speakers, sometimes our own staff and sometimes guest speakers, with an hour break in the middle to eat pizza. Earlier this year we had a Pizza Theology on Hearing God, which was so helpful and I’m still thinking about it months later! This semester we focused on the topic of race. I wish I could adequately articulate just how much I enjoyed it, how much it blessed me and so many other students, and how thankful I am for the work God is doing in this community to bring this topic, which so many choose to stay silent on, into the light. The topic of race is something I’ve been thinking about a lot in the past year, (mostly due to conversations I’ve had with friends, not because of any goodness in myself). God has taught me a lot through people who have had different experiences than me, and this Pizza Theology was so helpful in continuing my understanding of race, ethnicity, culture, class, and how to interact with all of these things as a disciple. One of my favorite things that was said was “if something matters to my brother or sister in Christ, it is my responsibility to understand and make that thing important to me as well.” One of my sweet friends and fellow Apprentices, Sandra, is one of those people that I’ve gotten to have conversations with about race over the past year. Her, and others, have been patient with me through my ignorance and bombardment of questions. She got to share her experience as a Mexican-Salvadoran American to our community as a part of Pizza Theology. She reminded our community that “we must not see people as tokens, but value and learn about everyone’s culture, especially minorities.” I’m so thankful to get the chance to learn from people like her, and I’d so totally 100% two thumbs enthusiastically way up encourage you to listen to it as soon as you get the chance! Remember Samantha, who I wrote about in a previous blog?! She got baptized! I wanted to write a little bit about something I think God said to me earlier this week. And it’s all a little bit heady and vague, but I’m hoping you’re encouraged by it. I’ve lately been trying to grow in some pretty specific areas, and I’ve got a lot of support from different people like Garrett, Shayla, and others who hold me accountable to those things. One day, I was struck with such confidence that God works in ways that are so perfect. His timing is perfect. Me doing this Apprenticeship at this time is not an accident. Him putting specific people in my life, letting me move to a different city from where I lived last year, going through challenging things, everything! He works it all out. I wouldn’t be growing and stretching if I wasn’t in the place I’m in right now. I sometimes don’t trust Him, and I’ve always had a hard time with the verse that says “we know that in all things God works for the good of those who love him, who have been called according to his purpose”. I’ll read that, or sing songs that say that, and in my head I’m like “... no way. God working for MY good?” It sounded to me like He’s this little task-master sort of going from person to person to make sure they’re doing okay, and calculating their every step to make sure whatever is good happens for them. But I realize more that He is good, and if we just stay close to Him, anything we face will turn out for our good. When I was a kid (and sometimes even still :) ), my dad always made me hold onto His hand when we were walking through parking lots. He would hold it so, so tight. And I would get so distracted. I’d just be doing my own thing, and then I’d feel the tug of his hand when I strayed too far. But as long as I stayed close and held his hand, I’d make it to wherever we were going safely. I feel like God reminded me of this. When all is boiled down, following Jesus and pursuing a relationship with Him is a matter of holding our Dad’s hand. He really does want what’s best for us. I’m so thankful He reminded me that His timing is the best, and that He really is so kind and good. Last thing, I wanted to invite you to Spring Showcase!! This is one of my favorite things we do. Every year we send a group of students to Student Institute of Campus Ministry (SICM), which is a conference in Bellingham, WA, that equips them to do campus ministry. Needless to say, there are some expenses involved in that. Spring Showcase is a concert-fundraiser for SICM. And y’all for real, I’m blown away every year by how incredibly talented my friends are. There will be art for sale as well, and some student testimonies. This is me inviting each of you. Selfishly, I’d love to see you :) but also it would bless our students so much who would get the chance to go to this amazing conference because of you purchasing a ticket! Also, yours truly will be co-emceeing with my sister, Sarah! If you’re interested in attending, you can check out anyfocus.org/showcase to get more details and to purchase a ticket. I love you guys so much. I love the students I get to work with every day, and you are such a huge part of the work I get to do with them. Thank you so much for investing in me this year and for being my biggest fans. You’re not just investing in me, you’re investing in individual students whose lives are being changed because of Jesus! How cool is that?! I mainly just wanted to show you this picture because I like these people. But it's also relevant because we're all Collin alum at the wedding of another Collin alum AND previous Collin Apprentice! I'm glad to hear that your class about the Holy Spirit has been teaching you a lot lately. I hope you can continue to grow your relationship with him. I'm looking forward to Spring Showcase, Pizza Theology sounded awesome as ever! Continue to do God's work on Collin! It's great reading about your experiences. Hey Hannah! I love that sweet story about your Dad. I think that really does illustrate how God guides us! I pray that he would keep teaching you (and me, and so many other people) that simple lesson of trusting him. If you get nothing else out of your year of apprenticeship, get that :) Love you Hannah! !